You'll be £19.99 closer to your next £10.00 credit when you purchase Alamein. What's this? In July 1942, German and Italian forces seemed to be at the point of sweeping away the remainder of British resistance in the Middle East and triumphantly overrunning Egypt. If this had happened, the disaster for the Allies would have been irretrievable. 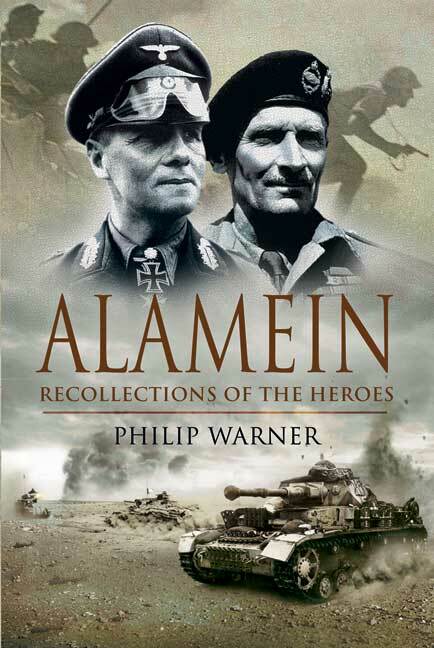 Instead, Rommel's victorious army was checked on the Alamein line in what became the first battle of Alamein. Two months later with Montgomery and Alexander as C in C Middle East, another Axis thrust was held in the second battle of Alamein at Alam El Halfa. On October 23rd the Allied forces were finally on the offensive and, after two long weeks of bitter fighting, Rommel's forces were in head-long retreat. The higher strategy of these battles has been well covered in other books, but this is about the men who fought in the tanks and minefields, in the sand dunes and behind the guns. Through a fascinating selection of first-hand accounts from battalion commanders and private soldiers alike, Philip Warner reveals the loyalty and chivalry, courage and hardship, humour and compassion behind these remarkable series of battles. Philip Warner (1914–2000) enlisted in the Royal Corps of Signals after graduating from St Catharine’s, Cambridge in 1939. He fought in Malaya and spent 1,100 days as ‘a guest of the Emperor’ in Changi, on the Railway of Death and in the mines of Japan, an experience he never discussed. A legendary figure to generations of cadets during his thirty years as a Senior Lecturer at the Royal Military Academy, Sandhurst, he will also be long remembered for his contribution to more than 2,000 obituaries of prominent army figures to The Daily Telegraph. In addition he wrote fifty-four books on all aspects of military history, ranging from castles and battlefields in Britain, to biographies of prominent military figures (such as Kitchener: The Man Behind The Legend, Field Marshal Earl Haig, Horrocks: The General Who Led From the Front (Pen & Sword, 2018) and Auchinleck: The Lonely Soldier (Pen & Sword, 2006) to major histories of the SAS, the Special Boat Services, Phantom and the Royal Corps of Signals. At El Alamein in northern Egypt, the British Eighth Army under Field Marshal Montgomery begin a critical offensive to expel the Axis armies from Egypt, never to return.